Bliss Juicery /www.blissjuicery.co.za (“the Company”) provides the information contained on this website (“website”) and advertises and sells the products to you (“the Customer”), subject to the terms and conditions set out herein (“the terms”). For the purposes of these terms, “products” means those items offered for sale on www.blissjuicery.co.za from time to time. By accessing and/or using the services offered via the website, the Customer agrees to be bound by the terms, as modified from time to time. The Company may at any time modify any of the terms and such modification will supersede and replace any previous terms. Whilst every effort is made to update the information provided on this website on a regular basis, the Company makes no representations or warranties, whether express, implied in law or residual, as to the accuracy, completeness or reliability of any information, data and/or content on the website from time to time. The Company reserves the right at any time to change or discontinue any aspect or feature of the website and any information, data and/or content on the website without notice. The Company may modify or discontinue from time to time, whether permanently or temporarily, any or all of its services with or without any notice and shall not be liable to any party for any such modification or discontinuance of our services. It is agreed that because of the nature of the Internet, the items on our website are presented as is and shall be provided to the Customer if stock is available. The Company shall not be liable if it is unable to supply a particular item, however the Company shall ensure that an item is supplied to the Customer which shall be as similar as possible to the original item requested. 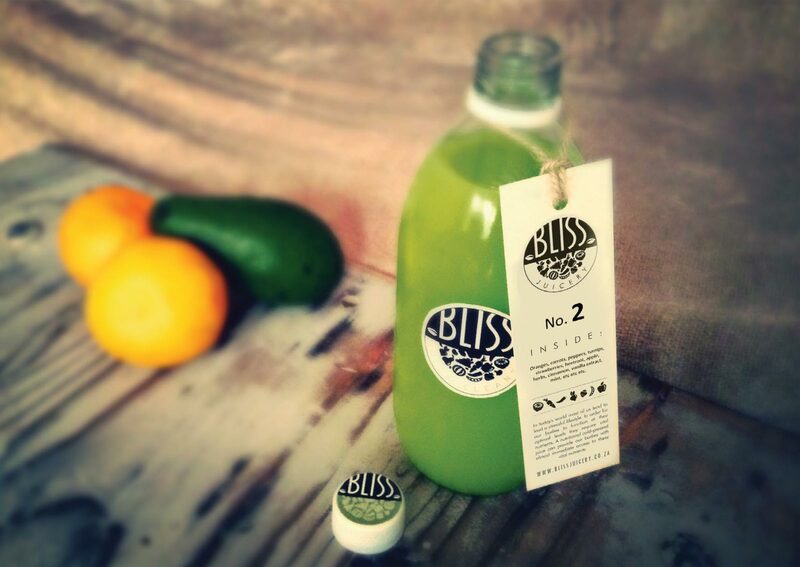 Orders must be placed via email or via the www.blissjuicery.co.za website. The Company assumes no responsibility for the timeliness, deletion, mis-delivery or failure to store any user communications or personalization settings. The Customer hereby agrees that all instructions, consents, orders and other communications which purport to originate from the Customer or a person who had authority to act on the Customer’s behalf to operate automatically (unless it is proved that such information system did not properly execute such programming) (collectively “the originator”) and which are sent to www.blissjuicery.co.za electronically and which may (as a result of interception, equipment malfunction, the distortion of communication links or any other reason whatsoever) be different from the instructions actually sent or given, or may not have been given by the Customer at all, shall be deemed to have been given by the originator in the form actually received by www. blissjuicery.co.za and the Customer will be bound by such instruction with no liability of whatever nature attaching to www.blissjuicery.co.za in regard thereto. The Customer waives any rights that the Customer may have or obtain against the Company arising directly or indirectly from any loss or damage of whatsoever nature which the Customer may suffer as a result of the fact that the Company acts on the Customer’s instructions/orders or instructions/orders purported to emanate from the Customer and the Customer indemnifies the Company against all and any claims, liabilities, losses, costs, fines, damages and expenses incurred (whether directly or indirectly) by the Customer, arising as a result of the fact that the Company has acted on the Customer’s instructions/orders or instructions/orders which purported to emanate from the Customer. Items will only be posted to the delivery address selected subject to availability and on receipt of full payment. Returns and exchanges are detailed in the Returns and Exchanges Policy. The Company reserves the right to cancel the order on notice to the Customer. Receipt of a confirmation of the order (which constitutes acceptance by the Company to process the order) will be sent to the Customer once we receive the Customer’s order. Please note that a transaction to purchase a product will only be deemed to have been concluded once the product in question has been paid for and posted/collected in accordance with the selected postal option. Delivery times are estimates only and the Company is not liable for any late deliveries. We reserve the right to verify the identity of any Customer. All orders shall be executed within the time period stipulated by the Company. The Company shall notify the Customer should any products be unavailable for any reason whatever. The Company reserves the right to add an insurance cost to orders above a certain value. Payment shall be made by electronic or bank transfers directly into the Company’s bank account. Orders will not be placed until money has cleared in the Company’s bank account in full. Customers are to use their invoice number as a reference when making payment. 8.8 The Customer may request a record of their transactions for up to 90 days, after which we will not be obligated to keep any records of the Customer’s transactions. Copyright and all intellectual property rights in all materials, texts, drawings and data made available on this website (collectively “the materials”) are owned by the Company alternatively, the Company is the lawful user thereof and are protected by both South African and international intellectual property laws. Accordingly, any unauthorized copying, reproduction, retransmission, distribution, dissemination, sale, publication, broadcast or other circulation or exploitation of such material or any component thereof will constitute an infringement of such copyright and other intellectual property rights. The Customer shall not use the website to send or post any message or material that is unlawful, harassing, defamatory, abusive, indecent, threatening, harmful, vulgar, obscene, sexually orientated, racially offensive, profane, pornographic or violates any applicable law and the Customer hereby indemnifies the Company against any loss, liability, damage or expense of whatever nature which the Company or any third party may suffer which is caused by or attributable to, whether directly or indirectly, the Customer’s use of the website to send or post any message or material as aforesaid. The Company does not make any warranty or representation that information and products advertised on the website are appropriate for use in any jurisdiction. By accessing the website, the Customer warrants and represents to the Company that the Customer is legally entitled to do so and to make use of information and purchase the products made available via the website. If for any reason the Customer needs to cancel an order, the Customer can do so by contacting the Company via www.blissjuicery.co.za. The Customer may be charged a handling fee of up to 20% of the invoiced amount. 15.1 The terms constitute the sole record of the agreement between the Customer and the Company in relation to the subject matter hereof. Neither the Customer nor the Company shall be bound by any express tacit or implied representation, warranty, promise or the like not recorded herein. These terms and conditions supersede and replace all prior commitments, undertakings or representations, whether written or oral, between the Customer and the Company in respect of the subject matter hereof. 15.2 The Company shall be entitled to cede, assign and delegate all or any of its rights and obligations in terms of these terms. 15.3 Should the Company be prevented from fulfilling any of its obligations to the Customer as a result of any event of force majeure, then those obligations shall be deemed to have been suspended to the extent that and for as long as the Company is so prevented from fulfilling them and the Customer’s corresponding obligations shall be suspended to the corresponding extent. In the event that force majeure continues for more than fourteen days after it has first occurred then the Company shall be entitled (but not obliged) to terminate all of its rights and obligations in terms of or arising out of these terms by giving notice to the Customer. 15.4 These terms shall be governed by and construed in accordance with the laws of the Republic of South Africa without giving effect to any principles of conflict of law. 15.5 A certificate issued by an administrator of this website shall constitute prima facie proof of any fact related to this website, including but not limited to which version of the terms and conditions govern a particular dispute and what content was published or functionality was available on the website at a specific point in time. 15.6 The deeming provisions of the ECT Act are excluded to the extent that no message shall be deemed to have been received by us unless we acknowledge receipt thereof in writing. This does not detract from the fact that if the Customer submits an order more than once the Customer may have concluded a double transaction for which the Customer will be liable and that a transaction will only be deemed to have been concluded between the Customer and the Company on delivery/collection of the product.